A High Court in Port Harcourt on Thursday ordered the EFCC to pay the sum of N600m ‘exemplary damages’ to two Rivers State Government officials for investigating their official activities on behalf of the state government and declaring them wanted. State Accountant General, Frederick Dagogo-Abere; and former Permanent Secretary, Ministry of Local Government, Lekia Bukpo. 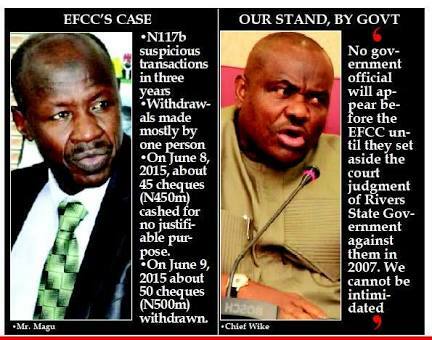 They were among those accused by the EFCC of withdrawing N117bn from state government coffers. But Governor Nyesom Wike had insisted that EFCC has no business with how Rivers State government spend their money for the development of the state and that if there was any problem, it is up to the State House of Assembly to act and not the EFCC. Delivering his ruling yesterday, Justice George Omereji declared that the anti-graft agency violated the fundamental rights of the officials by investigating the Rivers State Government’s account. He stated that the action was in disobedience of a subsisting court order restraining the Commission from investigating the state government account. Justice Omereji said he was embarrassed by the actions of the EFCC, adding that the Commission failed to appeal the judgment against it, but resorted to self-help by inviting the state officials. He said that the Commission should first try to vacate the subsisting order made by Justice Ibrahim Buba of the Federal High Court before taking any action on accounts of the state government. The judge also described the letter of invitation of the EFCC to the state government officials as malicious, maintaining that only the Rivers State House of Assembly has the right to investigate the financial activities of the state government. The court declared that the sum of N300m each be paid by the EFCC to Federick Abere and Lekia Biokpo as exemplary damages for declaring them wanted unjustly. Counsel for the Accountant General of the State, Dike Udenna, commended the judgment as a response to questions being asked by Nigerians on alleged abuse of power by the EFCC under President Buhari.